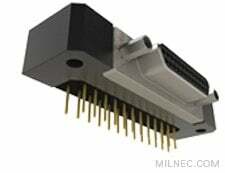 The M83513/16 PCB Micro-D connector offers a 90-degree design for wire management in confined spaces. The included PC tail contacts are available in three lengths to meet varying interconnect designs. Compatible with MIL-DTL-83513 / M83513.